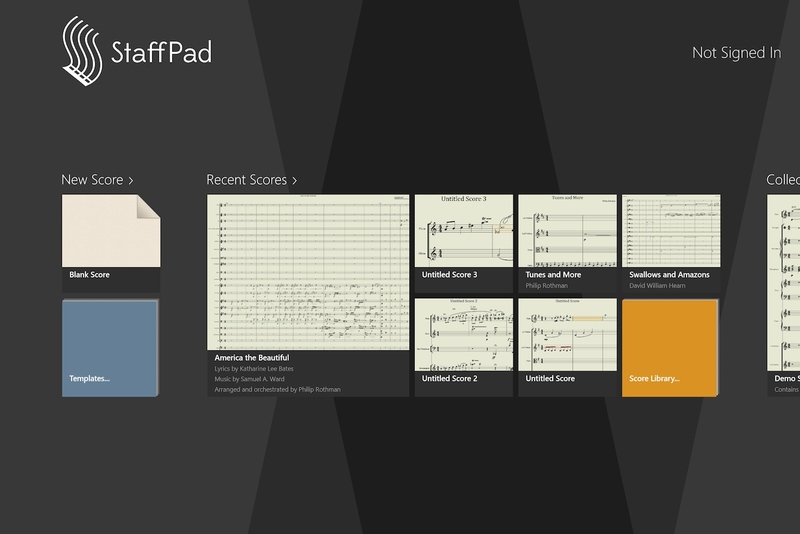 When you open StaffPad, you’re greeted with a collection of tiles that represent scores, as well as options for creating a new score from scratch or from a pre-exisitng template. Scores can be tagged and organized by collections, meaning that a score can be accessed from more than one collection. There’s a sound store, where you can purchase additional sounds that work within StaffPad — though the app comes with a nicely full-featured set already. 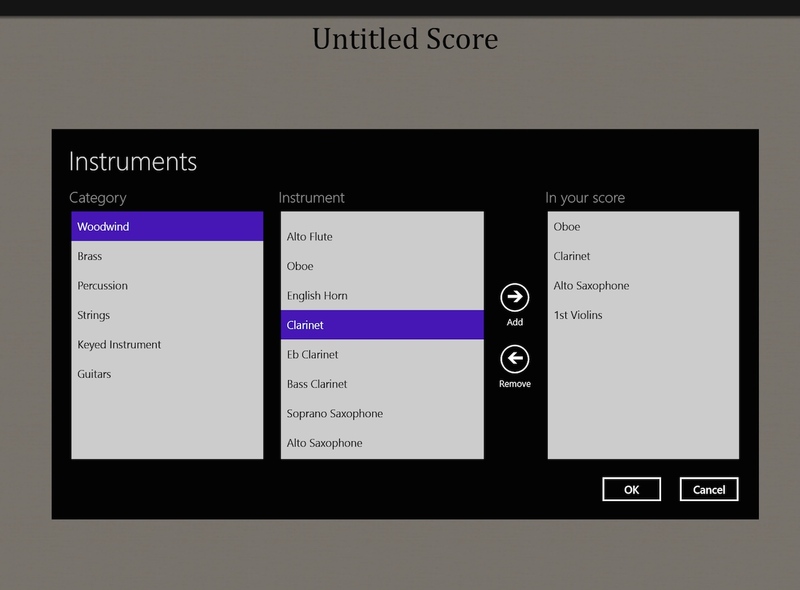 If you choose to create a new score from a blank score, you’ll be prompted to choose your instruments. This process will be very familiar to anyone already using Sibelius, Finale, or most other desktop notation programs. You choose instruments from groups and add them to your score, and StaffPad will automatically order them in conventional score order. You can then save your score as a template if you have a custom collection of instruments you write for on a regular basis (more on how to do that later). 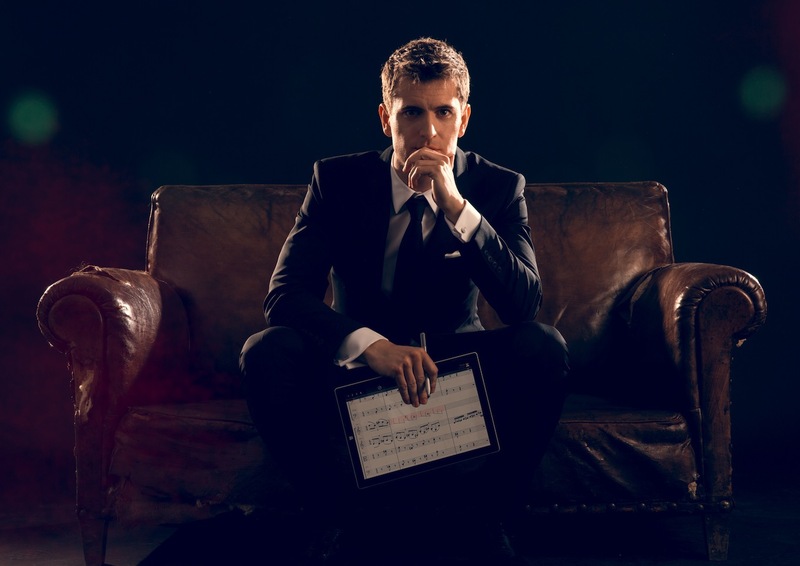 Although you may be tempted to just create a new score and start writing, I highly recommend first watching at least the “Getting Started” tutorial video and trying the interactive tutorial. The four other tutorial videos are also well worth watching early on. StaffPad is extremely intuitive, but you’ll save some time and frustration by learning more about how it works before diving in too much. 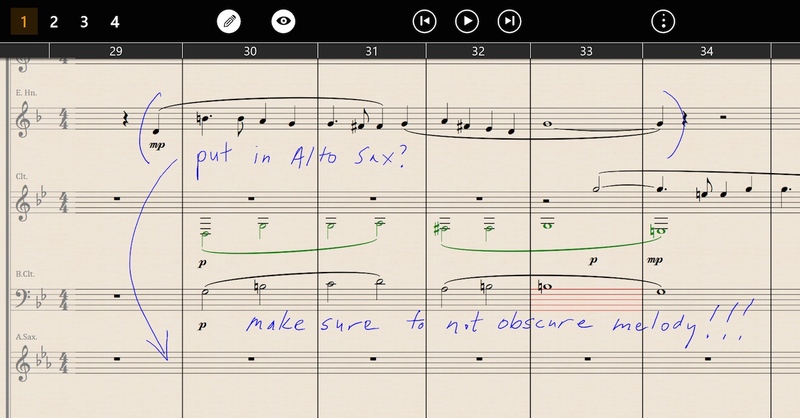 StaffPad works best when you write quick, unfussy strokes. Don’t be bothered filling in the blackness of a space to make a perfectly opaque, round notehead. A quick slanted line is what StaffPad wants for quarter notes and smaller; simple circles or ovals for half notes and whole notes. Accidentals are also best drawn in the manner StaffPad recommends: One continuous stroke in the style of a lower-case “b” for a flat; two complementary “L” shaped strokes for a natural; four strokes to make a “#” for a sharp. 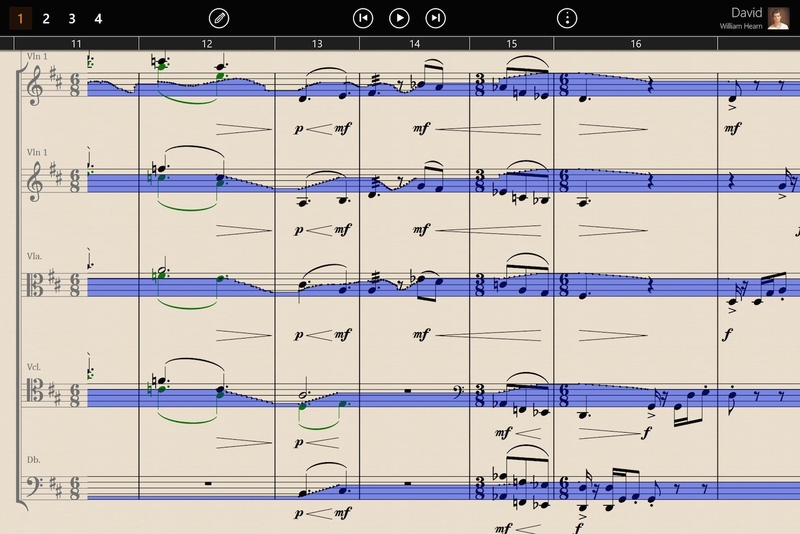 StaffPad is quite good at recognizing flags on notes to create unbeamed notes. You connect beams in an ordinary way, by drawing one or more lines connecting a set of notes with stems. StaffPad impressively recognizes note values as small as a 128th-note. Half and whole rests are drawn simply as a single horizontal stroke on the third or fourth line from the bottom, respectively. An eighth-note rest is drawn like the numeral “7”, with additional strokes in the middle for smaller durations. Again, rest values as little as 128th notes are supported. Quarter rests are a bit of a curiosity: StaffPad prefers that you draw those shaped like an “S”, but I preferred to draw them more naturally, in the squiggle style. As long as I was fairly consistent, StaffPad recognized my quarter rests just fine. Augmentation dots for notes and rests are drawn with a simple dot to the right of the note or rest. Leger lines are simple, short horizontal lines above or below the staff; it is not necessary that the vertical space between the leger lines equals a space. 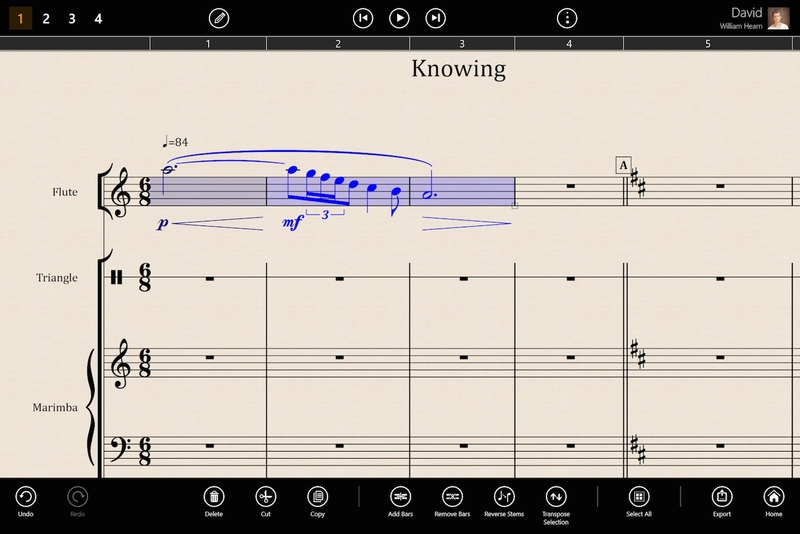 The distance between the lines is irrelevant to StaffPad, as it merely counts the number of lines to calculate the note — although if you draw the lines too close together, you’ll make it more difficult to precisely draw in your intended note(s). Chords are drawn by simply adding additional notes above or below the first note of the chord. 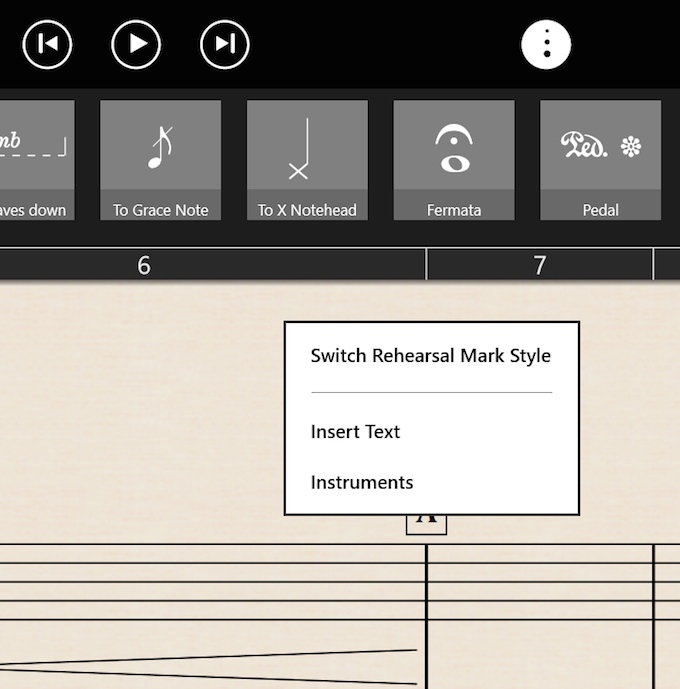 StaffPad will automatically add tuplets based on the context of the music and beam groupings, although you can draw in a numeral later, and StaffPad should recognize it, and bracket the notes when appropriate (such as over a group of quarter notes). Ties and slurs are drawn in the usual manner, and StaffPad intelligently recognizes the difference between the two: a tie being an arc between two notes of the same pitch; a slur being an arc over two or more notes of different pitch. Basic articulations are drawn as you might expect: staccatos as small dots, and marcatos as a inverted “v”, placed close to the notehead. Accents are drawn as “>”, and tenutos as horizontal lines as wide as the notehead. I found that StaffPad recognized staccatissimo articulations as well, as a short, vertical stroke placed near the notehead. In general, I found that reliably drawing articulations proved tricky, but I think an alternative way of placing them might be more effective (more on that later). If a bar is active, you can drag its right barline to add additional space to write more notes. You don’t have to be constrained to the default width of the bar. 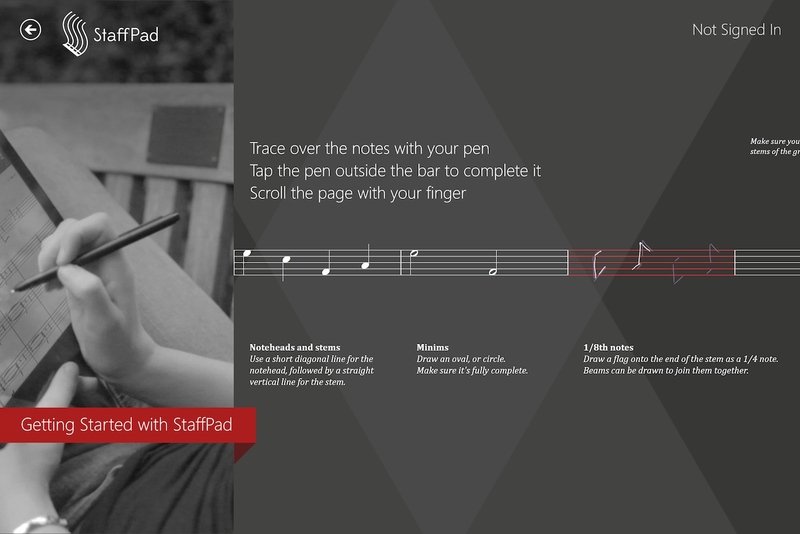 StaffPad will re-space the bar correctly once you finish writing in the bar. You might wonder how to erase something you’ve written: The Surface Pen includes an eraser button. Tap and hold the eraser button, and then use the pen to select or “paint” over any unwanted strokes to quickly erase them. The real magic of StaffPad starts to become evident as you begin to move from bar to bar. All you need to do to move to any other bar is to simply start writing in it. 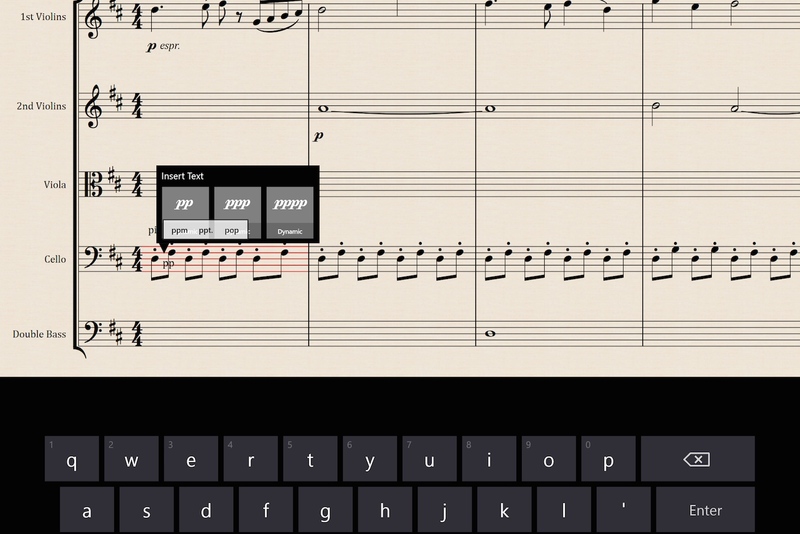 You don’t need to finish writing in one bar; StaffPad won’t automatically fill the bar with rests. You don’t need to write in contiguous bars or select another bar to prime it. It is so natural, it’s almost jarring if you’re accustomed to selecting an empty frame in Finale or selecting a bar and pressing N for notes before starting in Sibelius. Indeed, StaffPad won’t be perfect 100% of the time. If it can’t recognize something you wrote in the bar, it will render what it can, but it will leave the unrecognized strokes unchanged, and turn the staff lines in that bar orange. This signifies a “pending” bar. In the latest build I worked with, I found pending bars to be a mixed bag. StaffPad will try to guess at your intended stroke and present you with a few limited options. If none of those are correct, StaffPad will offer you the entire library of strokes from which to choose, remove, report or ignore. Even when I methodically went through and identified each stroke, sometimes StaffPad would still keep the bar pending, and nothing would change. The concept is good, though, and hopefully in time StaffPad will both get better at recognizing strokes and simplify the process by which one identifies those which are unrecognized. In any event, I heeded David’s advice to not let a pending bar interrupt my workflow. The genius of the concept is that you can move right along and get back to a pending bar later; your unrecognized ink strokes will be saved, and even printed (more on that in a bit). Once notes are rendered, you can do some pretty amazing things with them. You can erase them just like you do your ink strokes, and you can even erase the individual components of the rendered notation. For instance, tapping on a beam of eighth notes while holding the eraser button will turn those notes into unbeamed (flagged) notes; erase the flags to turn the notes into quarter notes. If you erase a stem on a half note, it will turn the note into a whole note. You can even tap-erase secondary beams between notes to break the secondary beams. Likewise, you can always go back to a rendered bar and add or modify the notation by drawing in more strokes. If you tap on a note, it gets colored blue. You’ll hear its pitch and you can drag it up or down to change it. 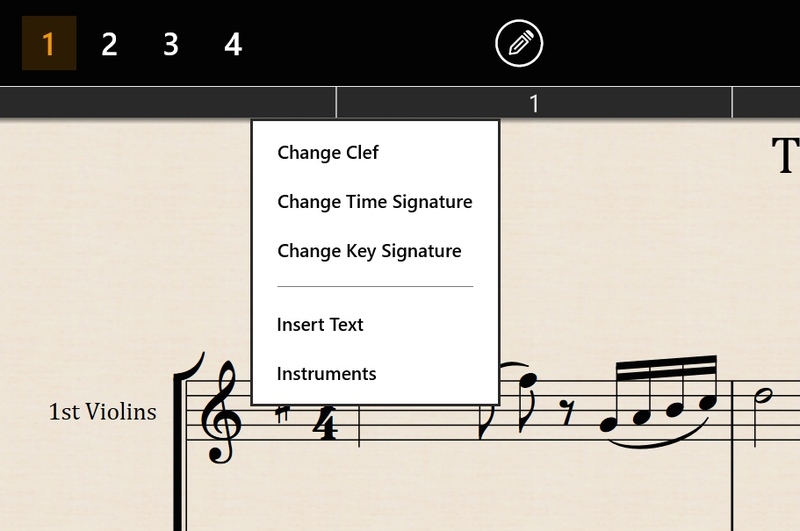 Drag a note left or right to temporarily add space for, say, additional notes or accidentals. You can tie notes between bars or slur over many bars with the greatest of ease. 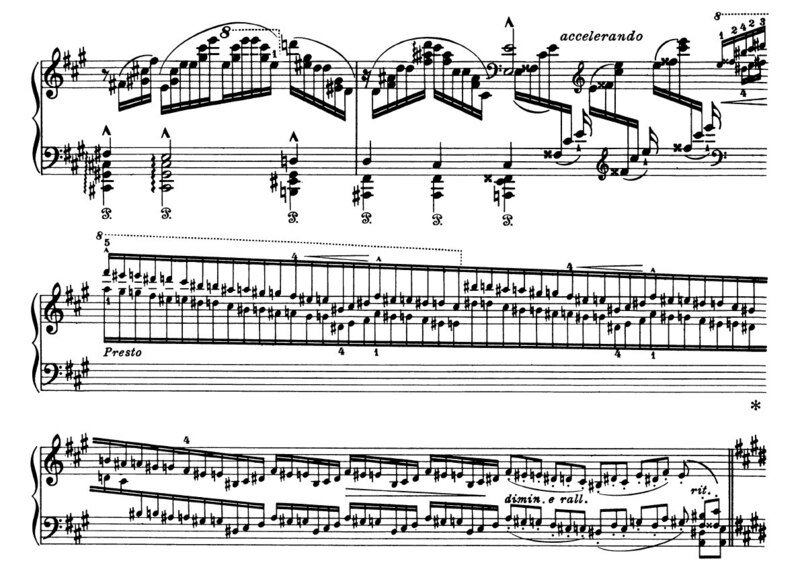 Slurs will snap to the nearest notehead, much as they do in Sibelius or Finale. Indeed, if you want to extend or contract an existing slur, just drag its left or right handle (the handles appear once the pen is in close proximity to the slur). To reposition or flip a slur, drag its middle handle. 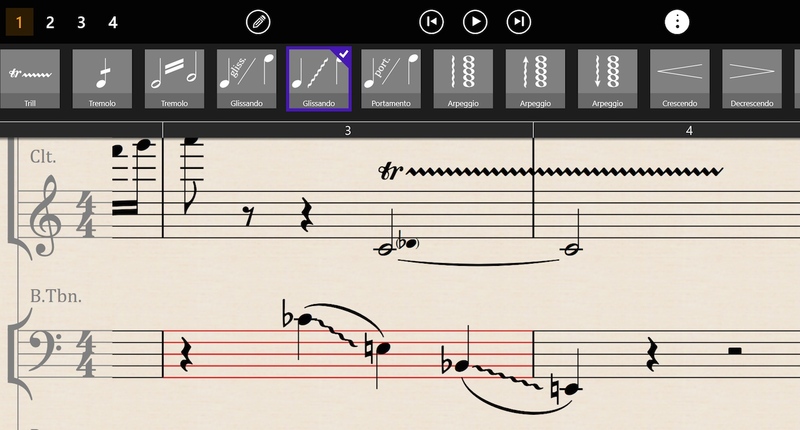 StaffPad supports up to four voices, like Sibelius and Finale. Tap on the voice number at the top left-hand corner of the screen to specify the current voice. Stem directions will automatically adjust once the bar is rendered. Finally, you’ll notice a pen icon at the top of the screen. Tap this to turn on a drawing mode, where you can freely write in blue ink on the score. Toggle the visibility of this layer on or off by tapping the eye icon. As you get more into the details of working with StaffPad, the importance of the pen and its relationship to touch becomes even more evident. The palm-rejection technology is excellent; you can rest your hand comfortably on the screen and write in a natural way. The pen is generally for writing and erasing music; your fingers are for moving the canvas, selecting bars and using the menus. There is some overlap — for instance, you can select most menu items with the pen as well as your finger — but each tool, as it were, does what it does best. If you touch and hold your finger on the screen, you’ll bring up a contextual menu. On the Surface Pen, the button above the eraser button is a “right-click” button, and so if you tap on the screen while holding this button, you’ll get the customary contextual menu as well. Touching and holding your finger — or “right-clicking” with the pen — just about anywhere on the screen will bring up a contextual menu with at least two options: Insert Text and Instruments. 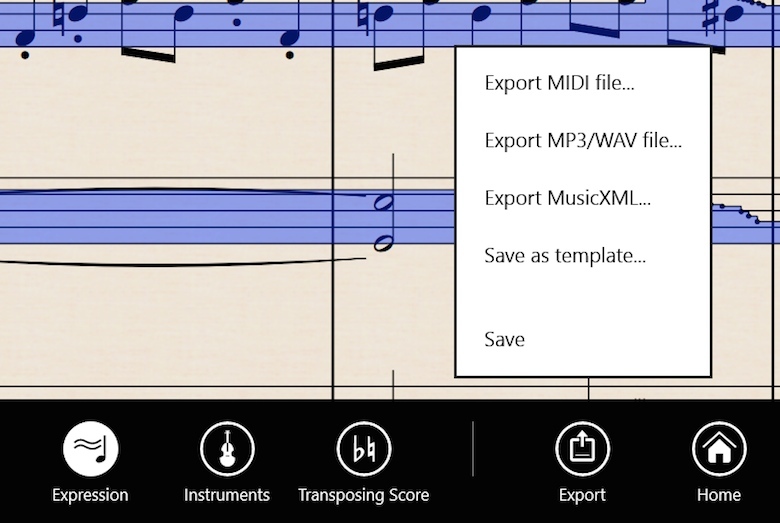 Selecting Instruments will show the same window seen when creating a new score, and so you can easily add or remove instruments in the same manner. If you’ve touched above a bar, the Windows keyboard appears, and you can type in technique text or tempo text. Simply typing in a number will tell StaffPad that you’re entering a metronome mark, and it will give you choices to select from (although dotted rhythms appear to have been omitted from the default options). Same with the most common Italian tempo terms: StaffPad recognizes “Allegro” and “Moderato”, for instance, and will automatically place these at the top of the system. If you type other technique-type text, such as “pizz.” or “arco”, StaffPad will place these on the top of the staff you had tapped on, in roman non-italic text. Touching below a bar works the same way, except that StaffPad will interpret this as expression text. Start typing a dynamic like “p” or “mf” and you can instantly select it. Type other text, like “espressivo” and it will appear in the appropriate spot, in italics. If you tap and hold in a bar, you’ll see a few more contextual options: Change Clef, Change Time Signature and Change Key Signature. Still, StaffPad offers a bit of assistance: under-filled bars will be colored grey, and over-filled bars will be colored red, to help you identify those bars that don’t conform to the time signature. What you do with them is up to you. If you touch and hold directly on a barline, you’ll see the Change Barline option in the contextual menu. Familiar options are available: double barlines, repeats, and final. Be aware that selecting a final barline is final in the true sense of the word: StaffPad will erase everything in your score afterwards. Touching a staff name is pretty interesting (you don’t need to hold). Here, you’ll be able to change both the full name and short name of the instrument, exclude it from printing, and adjust some playback options (oh yes, we will get to playback). 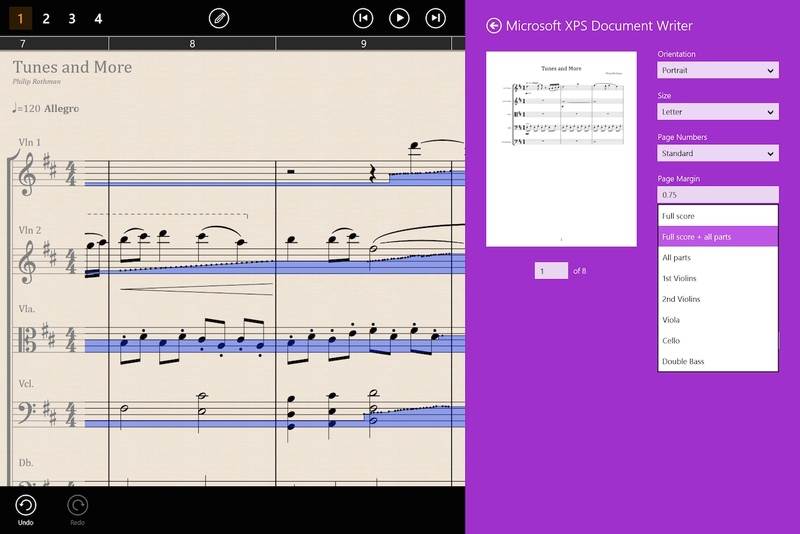 There are certain elements of music notation that are easier to enter digitally in StaffPad. These are found in the symbols palette, which can be accessed by tapping or touching the symbols icon on the top of the screen (to me, it resembles a snowman). The basic concept is that you select the symbol by touching or tapping it, and then you place it in the score by using the pen, although the exact method differs a little in each case. Trills, octave lines, hairpins and pedal lines are placed by selecting the the tile, tapping with the pen where the item should be placed, and then, if necessary, dragging the item to the right to extend it as far as you like. If, after you’ve placed the object, you find you would like to extend it further or contract it, first, deselect the tile in the symbols palette, then extend or contract it in the same way you do with slurs. Changing between a whole-step and half-step trill is accomplished by selecting the “trill-to” note with the pen and dragging it left or right. A single note tremolo is placed by selecting the appropriate tile and “painting” the notes with the pen from left to right. Dragging the pen up on up-stemmed notes, or down on down-stemmed notes, will add more strokes, up to three. It’s really cool! If you know how to place a glissando, and you know how to place a single-note tremolo, then you know how to place an alternating tremolo between two notes: just select the tile, tap between the two notes, and drag the pen up or down to add more strokes. Arpeggios work much as they do in Sibelius or Finale: you select the arpeggio, tap the chord, and StaffPad snaps to the correct span of the chord. StaffPad offers the regular arpeggio as well as versions with the up and down arrows. 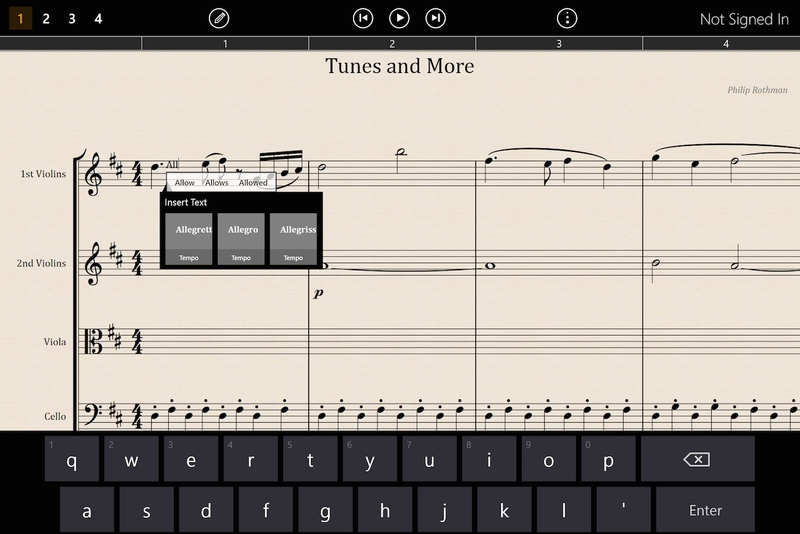 Grace notes and “X” noteheads are achieved by selecting the tile and then tapping on the note to change it. For grace notes, this means that you will temporarily over-fill the bar. 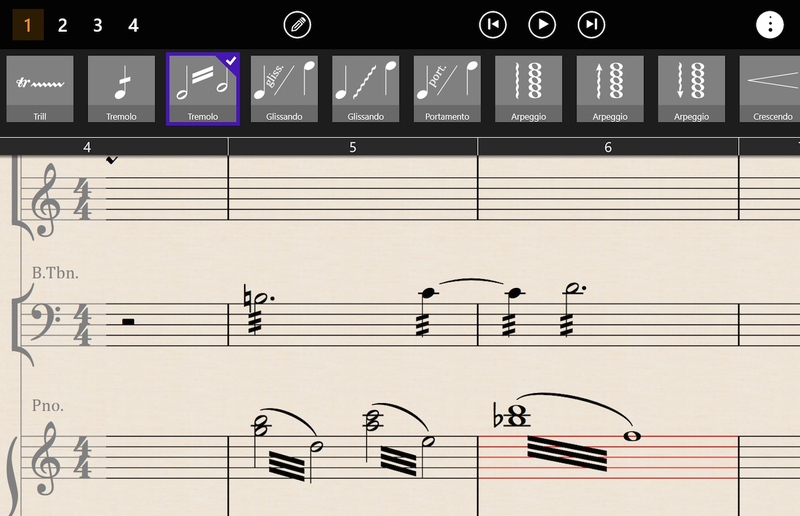 StaffPad easily converted both single grace notes and beamed grace notes, and you can erase or add beams to grace notes in the same way you can with ordinary notes. However, I didn’t see a way to change a grace note or an “X” note back into a regular note, other than deleting and re-entering the note, although David said that this will be fixed in an update to the app. Fermatas are placed by selecting the fermata tile and tapping on the note. StaffPad intelligently places the fermata not only on the note, but on all other notes on the same beat, on the theory that if one instrument is holding, everyone else is too. Of course, all of these items can be erased with the pen, using the eraser button. I found using the symbols palette very intuitive. At the modest risk of the palette becoming too crowded, I would like to see articulations added to it at some point. Especially when adding repeated staccato dots or accents, painting them in in the same way that is done for tremolos would be very convenient. This is where the pen-and-touch approach starts to bear more fruit. 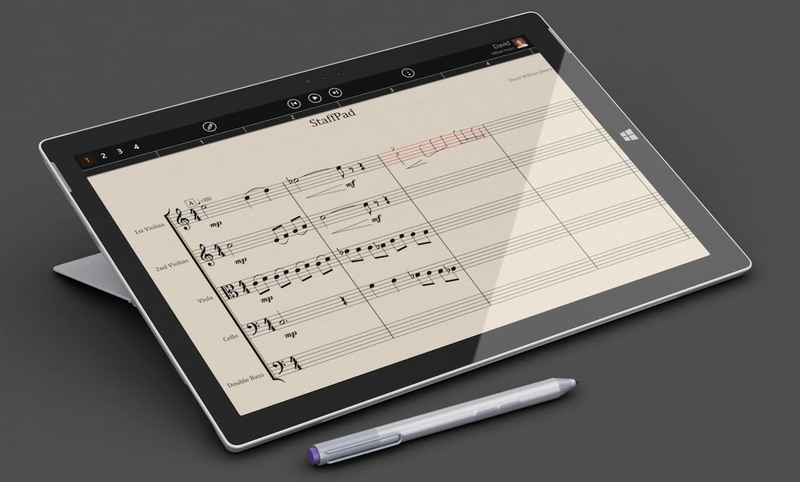 Because StaffPad knows that tapping using your finger is different than tapping using your pen, it frees up your fingers to select and manipulate music without it being interpreted as note and symbol entry. Selecting a bar is done by double-tapping on it with your finger. The bar and notes become colored blue, and a contextual command bar appears at the bottom of the screen. To expand a selection, single-tap on any bar above, below, to the left or right of the first bar you selected and all the bars between your initial and subsequent selection will be selected. Double-tap again, anywhere on the score, to deselect. Double-tapping on a clef will select the entire staff (only a single tap on the clef is necessary if a bar is already selected). The contextual command bar offers the familiar Cut, Copy, and Paste, along with Select All, with some nice visual aids: Copied source material turns yellow, and the bars representing cut source material turn red, until you’ve made a new selection and pasted the source into your destination. Like other programs, you only need to select the first bar of your destination. If you’ve made a selection, you’ll notice a handle in the bottom right-corner of the bar. Selecting the handle with the pen and dragging it to the right or down repeats the material into the adjacent bar(s), kind of like pressing R for “repeat” in Sibelius. I found that this only worked up to the edge of the screen and I was unable to drag further; it would have been nice if the score kept moving once my pen reached the edge. 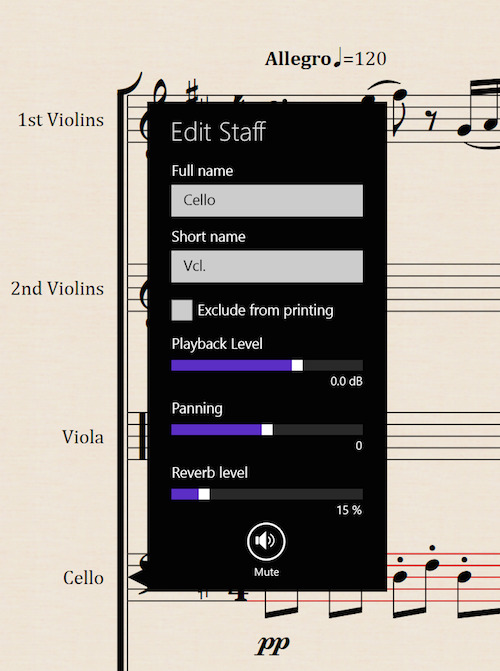 Tapping Delete will delete any of the music within the selection, leaving empty bars in their place, while Remove Bars will actually remove that bar (or “measure stack,” to borrow a Finale term) from the entire score. If you are familiar with inserting columns in an Excel spreadsheet, Add Bars works the same way: select as many bars as you wish to insert into your score and tap Add Bars to add the equal number of bars prior to your selection. Transpose Selection works as you would expect; select the interval and direction, and StaffPad helpfully tells you the number of semitones you’ll be transposing the music. 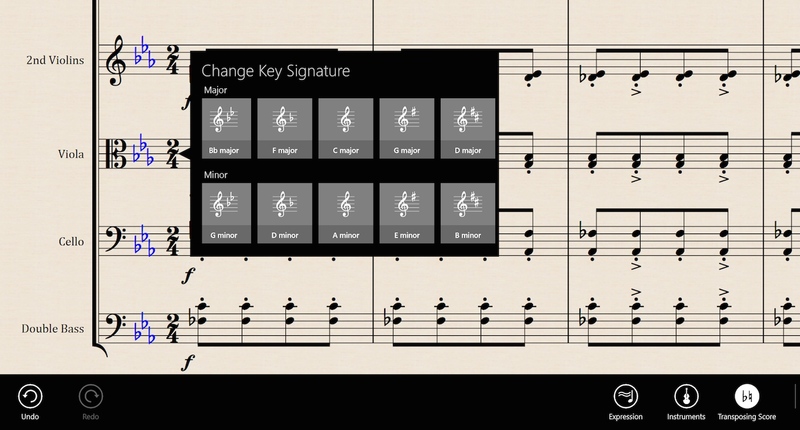 Transposing by key is currently not possible in StaffPad. Reverse Stems is a rather rudimentary way of “swapping” voices. If you have written music in voice 1 that is lower than the music in voice 2, tapping Reverse Stems will point the stems as if you’d swapped the voices, although the voice assignments remain intact. Perhaps an actual “swap voices” feature will be forthcoming eventually. Rounding out this contextual command bar are Undo and Redo; Export; and Home. These appear in the main command bar as well.